Calzaghe Kessler: Does Joe Have a Plan B? As World Boxing Organization super middleweight champion Joe Calzaghe (43-0, 32 KOs) approaches this Saturday’s bout with World Boxing Council/World Boxing Association super middleweight champion Mikkel Kessler (39-0, 29 KOs) at the Millennium Stadium, in Cardiff, Wales, a big questions is whether the 35-year old Calzaghe has a plan B should his slap happy style of fighting prove in effective against Kessler. Unlike Calzaghe’s mostly marginal other challengers, Kessler has an airtight defense, and excellent jab and a powerful right hand to go along with it. In Calzaghe’s previous 20 title defenses, he’s had much softer opposition, allowing him to get away with his slapping style and his wide open defense. Perhaps Calzaghe’s best opponent to date, Sakio Bika, had him plenty worried, as the African roughed up Calzaghe in the first half of the fight and him worried and confused, asking his father, Enzo, for advice at one stage in the fight. Now, Bika’s a good fighters but he’s not in anyway in the same class as Kessler, who is clearly several runs ahead of him in talent and ring smarts. If Calzaghe goes in against Kessler with his usual slapping style, he’ll likely have much more problems than the ones that Bika presented for him. Kessler, 28, will likely meet him with a stiff jab, snapping it over and over and keeping the smaller Calzaghe out of range. When Calzaghe does come in close, attempting to throw his slapping punches, Kessler will fire off his powerful combinations, and then quickly get away from him. Kessler doesn’t usually engage continuously, instead he prefers to throw several blistering punches and then escape to the outside where he fires off repeated machine gun like jabs. Calzaghe has said recently that he plans on fighting one more year and then retires, mentioning that he doesn’t want to be like Evander Holyfield and still be fighting when he’s 44. However, what Calzaghe is failing to realize is that should he lose badly to Kessler, all of his dream bouts with the likes of Bernard Hopkins, Jermain Taylor and Kelly Pavlik, will be out the window, because none of them will likely see much value in fighting a tarnished Calzaghe. Indeed, the mostly scenerio will be for Calzaghe to fight Kessler in a rematch, trying to claim revenge and erase the stigma of a one-sided loss. Kessler will probably give him the rematch, because the fight will make him a ton of money, but the outcome will be the same, with Kessler wiping the deck with the older Calzaghe. 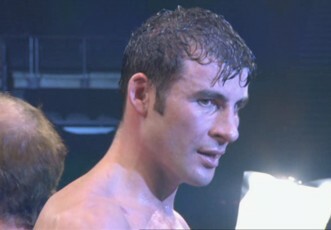 Boxing » Joe Calzaghe » Calzaghe Kessler: Does Joe Have a Plan B?